East Lake Medical Clinic (St Cloud) - Book Appointment Online! 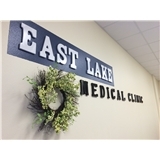 At East Lake Medical Clinic, we provided urgent care for acute illnesses and injuries as well as chronic disease management. Please visit our website at www.eastlakemed.com for more details. Dr. Dustin Ly, MD is Board Certified in American Board of Internal Medicine. He takes pride in his work and personally seeing all of his patients. For continuity of care, he also sees patients in local hospital and nursing homes. Urgent Care Services Primary Care Chronic care Medical Weight Loss Flu Injuries from Works, Sports, Motor Accidents STD: Testing and treatments DOT physicals Medical Marijuana *NEW* Pre-employment exams School and Sport physical exams Travel Medicines Vaccinations TB testing WoundCare Labs test in office. I think that the doctor is very professional and listened to my concerns in an appropriate manner. I felt at ease, and feel comfortable in returning for a follow up appointment.